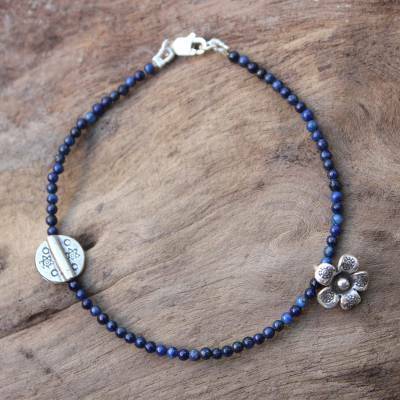 Hill Tribe Silver and Lapis Lazuli Bracelet, "Hill Tribe River"
Thought to purify the soul, lapis lazuli is a mesmerizing gem; it flows around the wrist like a deep blue river. Somluck Komolmith crafts a bracelet of exquisite beauty, adding silver charms from Thailand's Karen hill tribe artisans. Loved this bracelet, the only problem was the thread broke after a couple of months. Got it fixed, no worries. Love how dainty this is! It's beautiful! This is for a friend.. I know she will like this. Love it with my stack of wrist-wear! "I am in love with the detail and beauty of this br"
Excellent craftsmanship! Lovely detail. I would recommend to anyone! "loved the bracelet but the clap broke in two weeks"
Very nice but my old fingers couldn't manage the clasp. I had to return but only because of that reason. Goes well with my other hill tribe bracelets with fleurs on them wear them all together because the are not big but we'll made.